In Star Wars, Princess Leia records a 3D hologram of herself appealing for help from the Rebel Alliance in her epic battle against the Empire. The Emperor himself projects holographic messages to his henchman, Darth Vader. And, very soon, you too will be able to transmit messages in a similar way, whether or not you are involved in a galactic battle between good and evil. Thanks to scientists at the University of Arizona, real-world holograms have finally started to catch up with their fictional cousins. In a paper published today in Nature, they report the transmission of moving 3D images from one place to another in almost real time. This means it may eventually be possible to communicate with moving 3D images of friends or colleagues who are on the other side of the world. Surgeons will be able to use the technology to step into virtual operating theatres in other cities, and films will become ever more immersive. "Holographic telepresence means we can record a 3D image in one location and show it in another location, in real-time, anywhere in the world," said Nasser Peyghambarian, who led the team behind the new technology. Until now, scientists have been able to create holograms that display static 3D images, but creating video has not been easy. Two years ago, Peyghambarian's team demonstrated a device that was able to refresh a holographic image once every few minutes – it took around three minutes to produce a single-colour image, followed by a minute to erase that image before a new one could be written into its place. In his latest project, Peyghambarian's team reduced that image refresh time to two seconds. They also showed it was possible to use full colour and demonstrated parallax, whereby people looking at the image from different angles will see different views of the image, just as if they were looking at the original object. One of the first applications is likely to be in telepresence meeting systems. The most advanced modern telepresence systems use large, high-definition video screens to display standard 2D images. Holographic technology could be incorporated to make the people on the screen 3D. "Let's say I want to give a presentation in New York," said Peyghambarian. "All I need is an array of cameras here in my Tucson office and a fast internet connection. At the other end, in New York, there would be the 3D display using our laser system. Everything is fully automated and controlled by computer. As the image signals are transmitted, the lasers inscribe them into the screen and render them into a three-dimensional projection of me speaking." The holographic images are captured using feeds from an array of standard video cameras, each recording the subject from a different perspective every second. More cameras mean more perspectives can be recorded, so the resulting hologram can be more detailed. The visual information is encoded into short laser pulses that write individual holographic pixels, known as hogels, on to a screen. "If you go to a 3D film like Avatar, you'll see only two perspectives, one for one eye and one for the other eye. In our case, we've demonstrated 16 perspectives, but the technology has the potential to show hundreds of perspectives. It's very close to what humans can see in their surroundings," said Peyghambarian. "In surgery, for example, the cameras will be around where the surgery is done, so that different doctors from different parts of the world can participate and they can see things just as if they were there." 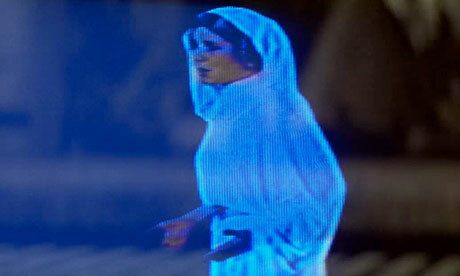 Whereas the image of Princess Leia in Star Wars is projected in three-dimensional space, the new technology uses a 2D screen to create the illusion of 3D. At the heart of Peyghambarian's system is his team's invention of a new type of plastic known as a photorefractive polymer. The material, which is used to make the screen, allows the researchers to record and erase images quickly. The protoype described in Nature used a 10-inch screen, but the team have already improved on this with a 17-inch version. "In terms of size, if you look at that famous hologram of Princess Leia, we are about that size," said Peyghambarian. "It is actually very close to reality. It is no longer science fiction, it is something you can do today." Bringing the 3D holographic technology to market will involve reducing the size of the individual hogels to get a sharper image, and increasing the refresh rate of the image to around 30 times per second, so that it has the same smoothness as television. Even then, said Peyghambarian, the amount of data needed for a telepresence system could easily be carried by standard 2 or 3 gigabit per second internet cable of the kind already in use today.